well, here it is as of tonight..its on its side compared to the system layout diagram posted previously, so the modules on the rightmost column are the oscilators. 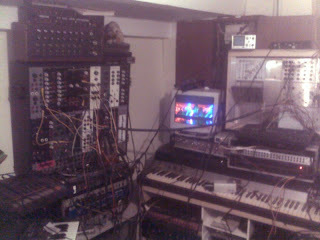 the other one is the matrix mixer. in the rack is a patchbay and two RGB-pal and YUV-pal encoders and sync pulse generators. sitting just on top of the rack is a panasonic AVE-3 effects generator, which TOTALLY RULES. i recommend buying one. ill draw up a system flow diagram at some point soon, to show how its all synced up. 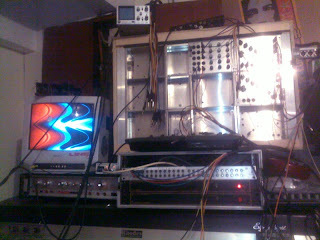 heres another pic of it being modulated in parallel with some drones from the audio modular. it kind of goes without saying that i am currently as happy as a dog with two di.. er.. tails. anyways.. ive started drawing up the schematics, and am trying to make them legible. the pcb layouts of the modules ive already built are done, but i may redesign them to use standard maplins stylee pots rather than the surplus ones i used which have a funny pinout.. ive also done some component layout diagrams. i reckon there should be a forum for this kind of thing somewhere. anyone know anything about setting up forum servers or list servers etc? my email addressl is cunningly disguised on the right...---> please get in touch.